In many parts of the world around this time of the year carnival in some form or other is taking place and here I’m going to tell you about two very different carnival celebrations. Originally associated with a big blow out before the restrictions of Lent, depending on the location carnival nowadays isn’t necessarily on during the days just before lent but usually takes place sometime in February-March. Of course many carnivals do take place in the few days leading up to Lent, but some, like the notorious Notting Hill carnival in London, happen at a completely different time of the year. 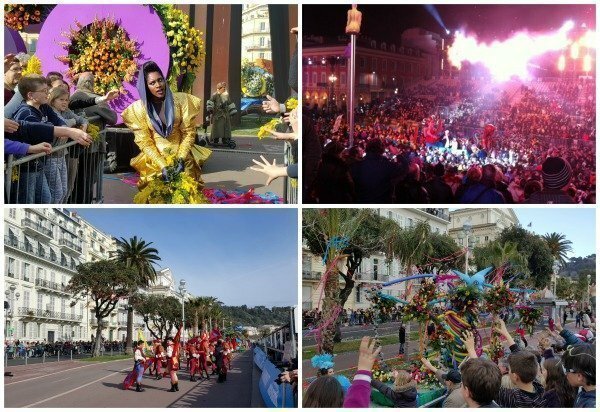 Our local carnival on the Côte d’Azur, Carnaval de Nice, lasts just over two weeks and is timed to coordinate with the winter school holidays optimising visitor numbers to the max. It is in full flow now. I’ve written plenty about Nice carnival before (see further reading at the end of this post) but over the last couple of years it’s changed, unfortunately in my opinion, for the worse, as it no longer has any free areas. Under the guise of “security” all access areas are now paying which I think is totally wrong and contrary to the spirit of carnival. I’m not sure if I’ll go this year or not which is sad because I used to love it. You used to be able to wander around freely and mingle with the floats and their bands of followers, all for free, whih is how it should be as far as I’m concerned. Now, even having paid you are mainly kept behind barriers. I’m not against having a paid area, in the viewing stands, where you are guaranteed a seat, but to have no free area at all is a terrible shame. It’s supposed to be a people’s festival, and it couldn’t be more different to the best carnival experience I ever had. And that was at…. 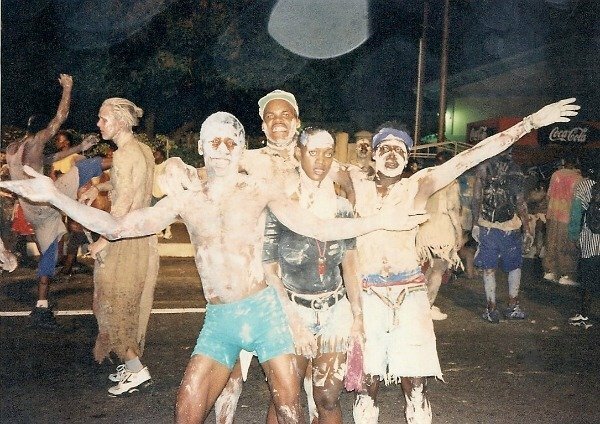 Many moons ago, JF and I went to Trinidad carnival in Port-of-Spain. Billed as the “greatest show on earth” it’s hard to beat the incredible joie de vivre and effervescent happiness at this very special event. Everyone gets involved and it’s a spectacular leveler: for 3 days everyone is equal, no matter where you come from, what your socio-economic status is, your race, religion or sexual orientation, everyone joins in and is treated the same. I didn’t take many photos, this was pre-digital and certainly way before the convenience of a smart phone, but back in those days I made albums and stuck newspaper cuttings in alongside my photos. In the photos from the Trinidad Guardian below there are pictures of the Prime Minister’s wife and Leader of the Opposition, both in full “mas”! “Mas” is short for masquerade, in other words, dressed up/in costume/in disguise. Bands have a theme and locals and people from all over the world alike can sign up to join the band, wearing the appropriate “mas”. For a good description of joining a band read here. But of course you don’t have to join a band, and we didn’t. 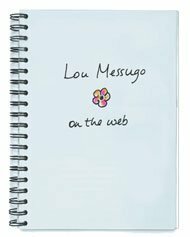 In fact we knew very little about what we were getting ourselves into as this was before the internet, before blogs and Pinterest. The only “research” we’d done would have been to read a paragraph in a guide book, if that! JF and I took an old cargo ship from Barbados, via St Lucia and St Vincent and the Grenadines to Port of Spain. The ship had a few very basic cabins for passengers and despite the rudimentary level of comfort and the very small number of passengers, this was a party ship! 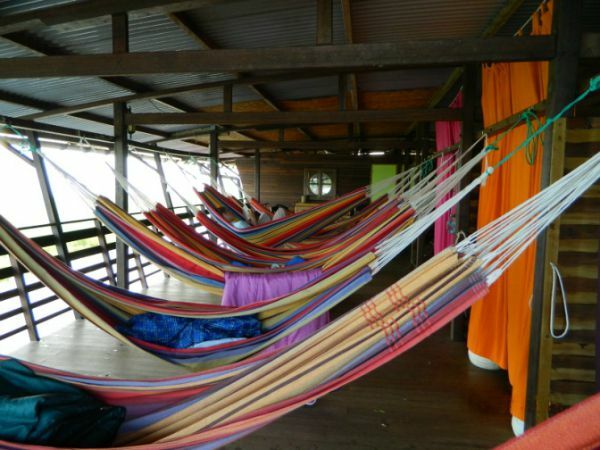 It was to be our home for the return voyage and four days at carnival, somewhere to lay our heads down for the odd snooze in between manic “fete-ing” (partying). And the party started as we climbed on board, the small deck was stacked with enormous speakers blasting out that year’s soca hits “Big Truck” and “Follow the Leader”. 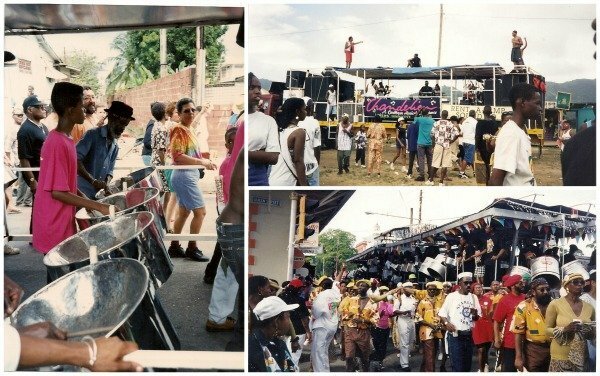 (Click to listen to the sounds of carnival 1997). People were “wine-ing”, bumping and grinding, quite an eye-opener even for open-minded well travelled folk like us, and it didn’t stop for the week long trip! Carnival in Trinidad goes from the Sunday to the Tuesday before Ash Wednesday taking in Dimanche Gras, J’ouvert, and Mas; it’s a time of competitions, flamboyant costumes, loud music (soca, calypso and steel pans), dancing (in particular “wine-ing”) and partying (also called fete-ing). We arrived in time to see Kiddie Carnival which was a more wholesome family-oriented affair on the Saturday, but nevertheless impressive, with kids decked out and dancing to soca and steel pans. The next day, Dimanche Gras, competitions took place to choose the Calypso Monarch and crown the Kings and Queens of the bands. Luckily it was a relaxed, reasonably calm day because everything really took off at “j’ouvert” in the early hours of Monday. This crazy event takes place in the middle of the night and consists of everyone getting covered in mud and paint and it’s pretty hard to avoid getting splattered. This is a time for old clothes, definitely not carnival costumes. I remember sneaking back to the ship at dawn to grab a couple of hours of sleep before heading out to Carnival Monday. On the Monday the mas bands start parading but on a casual scale, with revellers only wearing parts of their costumes. This is not the big competition day yet. 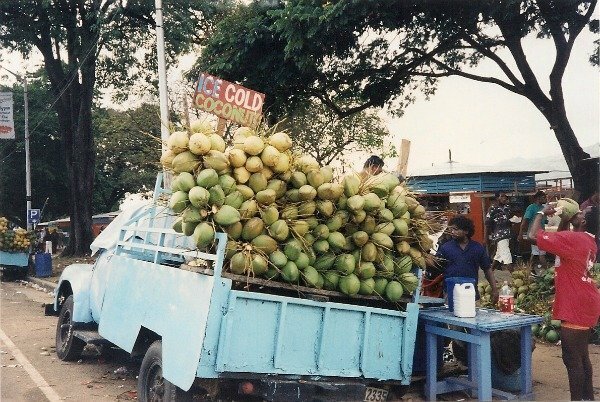 We wandered around, following trucks with steel bands and dancing in the streets. The weather wasn’t great, with some heavy rain, but it didn’t dampen the fun, just refreshed us a little! Finally on the Tuesday, Mardi Gras, the bands put on their greatest show, with full make-up, costumes and hundreds if not thousands of frenzied followers decked out in the theme of the band. The atmosphere was electric: an explosion of unbelievable energy, vibrant colours, blasting sounds, enormous smiles, gyrating “wine-ing” bodies, stupendous costumes, steel pans, fabulous street food, rum, Carib beer and very very sore feet! Hours and hours of dancing, shuffling and following along with the different bands took its toll on our poor feet, but we were young and partied on to the very end. 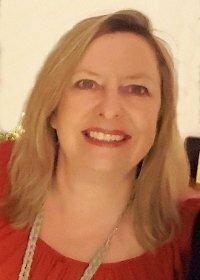 One abiding memory is that we were told it stopped at midnight on Tuesday and with party mode in full flow only minutes before the clock struck twelve we really didn’t believe it would end then. But it did. 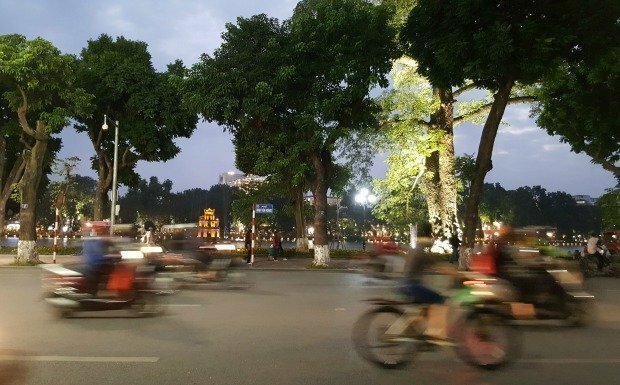 On the strike of midnight, everyone faded away home and street cleaners came out in force. Lent had begun and the party was over. I have no idea if it is still as strict as it was back then but it was impressive to see such an abrupt end to three full on intense days of fete-ing. 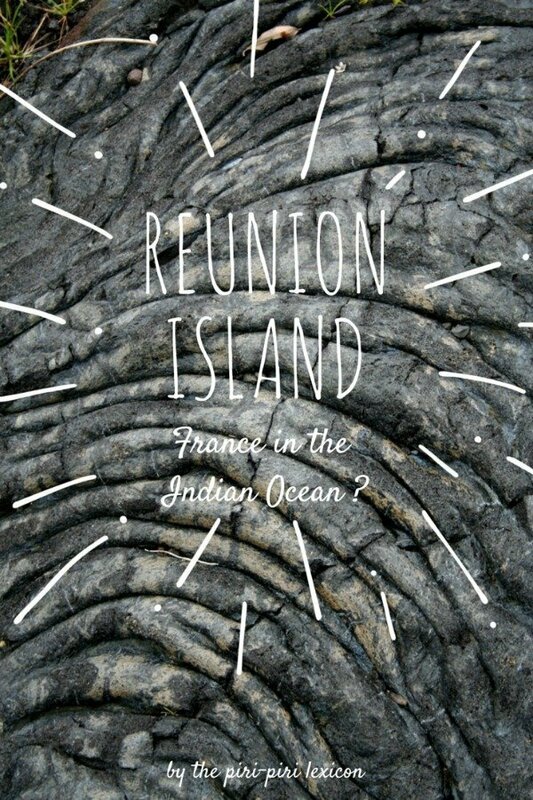 On Ash Wednesday we toured the island, chilling out on some beautiful beaches, still in awe that the party had so thoroughly dissolved. 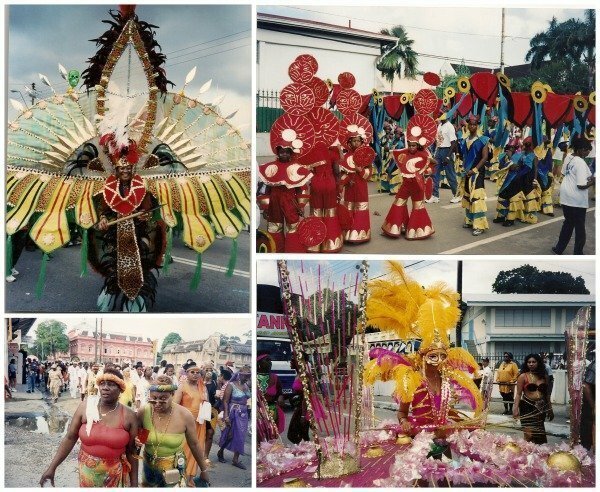 Carnival in Trinidad really is one of my most special travel memories. 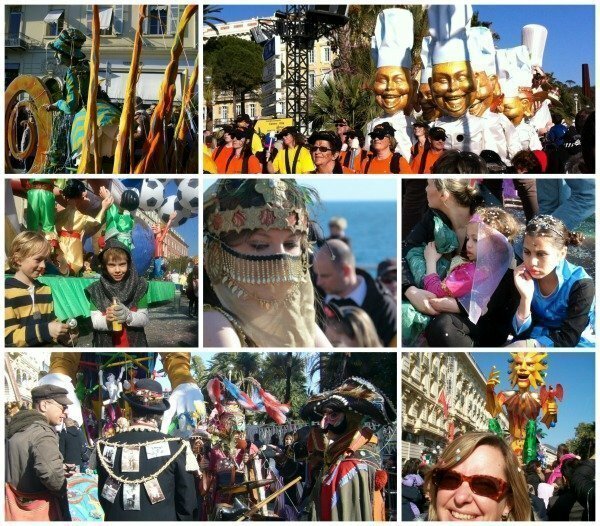 From our unique means of transport/accommodation to the incredible festival itself, it was one of a kind and every year when Carnival comes to Nice I remember it with an enormous smile on my face. Pulling out my old photos, finding the music on YouTube and writing about it has me grinning from ear to ear. 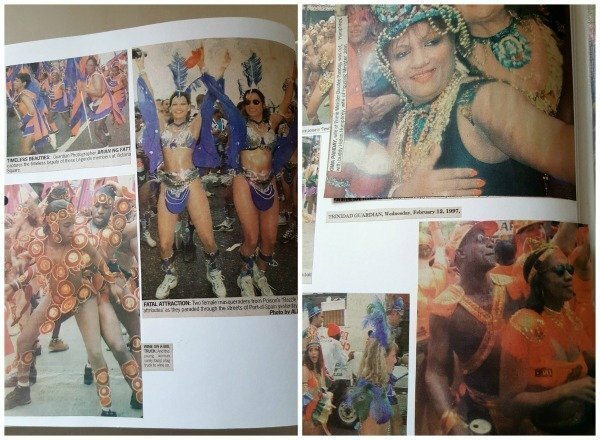 Click here if you’d like to find out more about Trinidad carnival and its traditions and more than anything I recommend you experience it (at least) once in a lifetime. 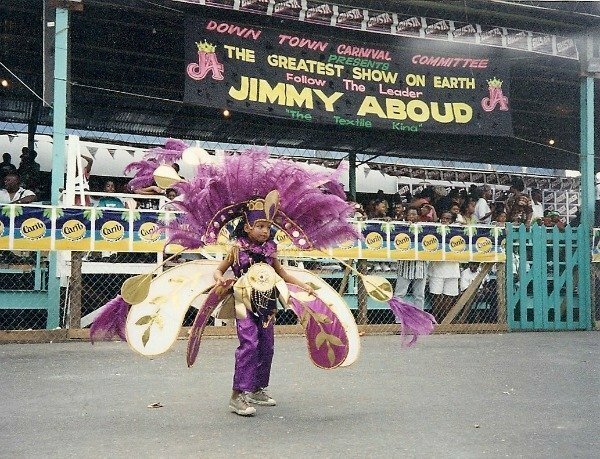 Have you been to carnival anywhere? I’d love to hear your experiences. We loved the Nice carnival when our son was little – the freedom to wander around, throw silly string, get up close to the floats. It’s a shame it’s changed but it’s understandable. In my own town of Spalding in Lincolnshire we had a tulip festival every year with floats etc. That’s now finished – not enough tulips being grown in the area (although we used to bring them in from Norfolk) but mainly it became too expensive: security costs just became too high. Such a pity. It is interesting to see the different takes on carnivals different countires have. The only one I’ve ever been to was carnival in Cologne. 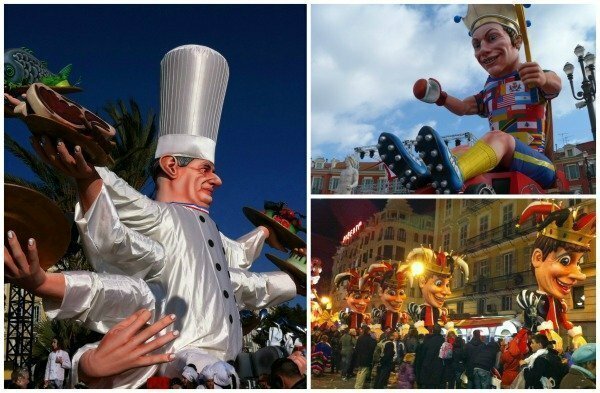 The little town of Limoux in Languedoc does what’s billed as the world’s longest carnival. 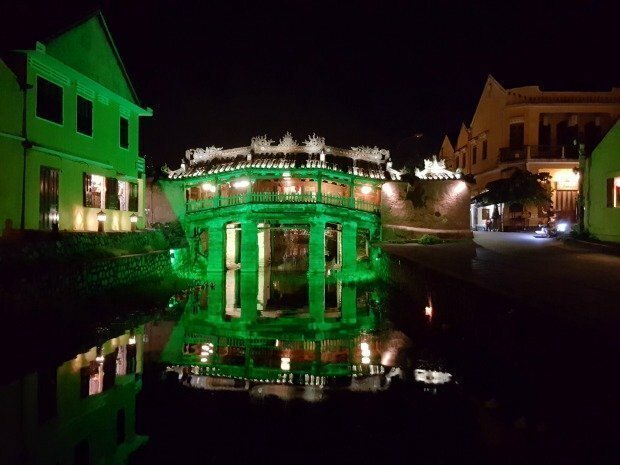 It’s nice because the town really gets into it and it’s small enough that it isn’t commercial or restricted behind pay walls. Another great Carnival is Venice, of course. The weather–all fog and mist–adds to the setting, as locals dress up in magnificent velvet robes to sweep like phantoms through the streets. Like a scene out of Amadeus. I do remember your sore feet and the cabin on your cargo boat didn’t have a window. Happy memories.